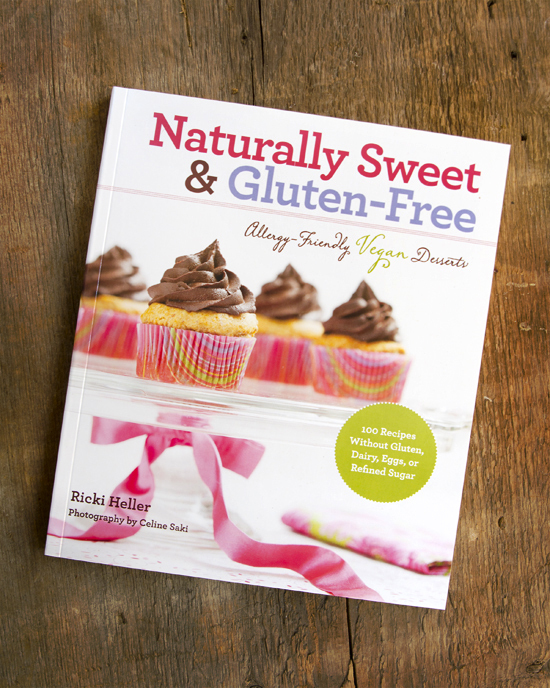 I’m pretty excited to be a part of my friend Ricki’s virtual book tour for her beautiful new cookbook, Naturally Sweet & Gluten-Free. You may have already read the praise she’s been receiving from others, like Angela, Gena , JL, Carolyn and Dreena. Ricki’s blog, RickiHeller.com (formerly Diet, Dessert & Dogs), has become a go-to resource for vegans and others with food allergies or sensitivities or looking for insight into the anti-candida diet. Over the years, Ricki has shared her struggles with health and weight because of her addiction to unhealthy sweets. When she cut out all refined sweeteners from her life, she began to search for alternatives and, in the process, learned to create recipes that are both healthy and satisfying. 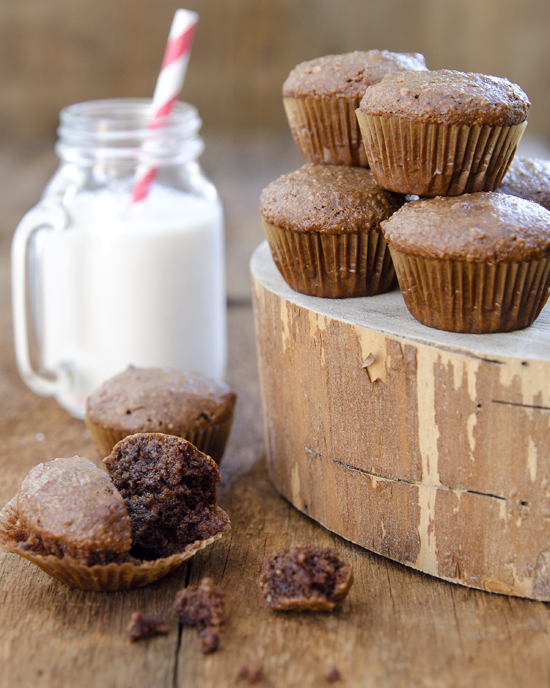 Her new book features an array of sweet treats that are vegan, allergy-friendly and, with the use of sweeteners like coconut sugar, stevia or agave nectar, every recipe has a reduced glycemic load. So, if you love baking like I do but want to start making use of ingredients like gluten-free flours and natural sweeteners, and also avoid common allergens like gluten, dairy and corn, this book is for you! Baking with natural, whole-food ingredients is simply better for your body and, ultimately, your well-being, but Ricki has also taken great care to ensure her recipes taste just as good as traditional desserts, if not better. I’m so proud of Ricki on this new book, which also features beautiful, full-page photos scattered throughout, and I know it will soon become a cherished book in my collection. Since Ricki is a local vegan superstar here in Toronto, I first had the opportunity to meet her at Ange’s birthday party back in 2011, when she introduced me to her Happy Hemp Two-Bite Brownies. 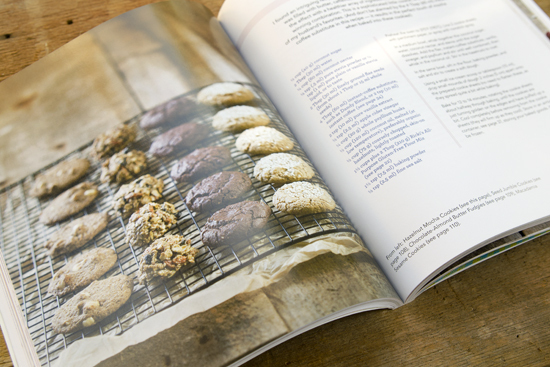 When I came across the recipe in this book, I knew it would be one of the first things I made. These high-protein, bite-sized gems are a perfect little pick-me-up after a long day of work or school—and they’re made with almonds and hemp seeds to boot! Ricki knows the process of baking without gluten, eggs, dairy or refined sugar is a little different from that of conventional baking, so her book also includes a thorough introduction on how to best use whole-grain, gluten-free flours, natural sweeteners, natural non-hydrogenated fats, and vegan egg replacers, as well as what to expect when baking with whole-food ingredients. 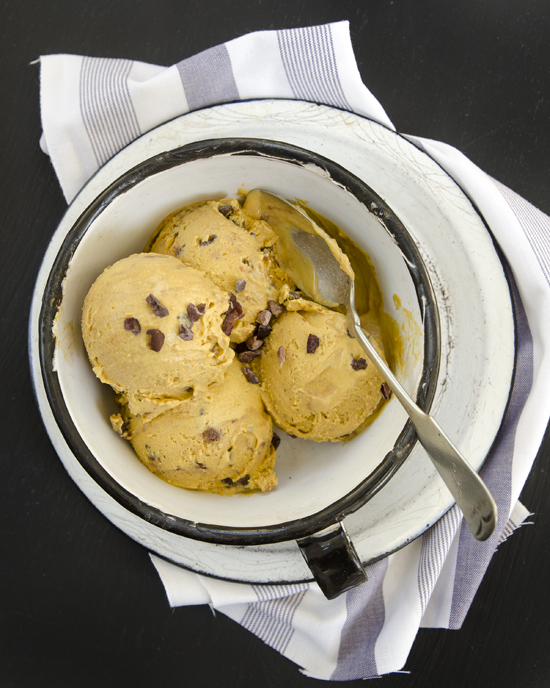 This Caramel Ice Cream, for example, makes use of cashews, sweet potatoes and coconut milk. It may seem like an unusual combination of ingredients that aren’t meant for ice cream, but you will be amazed by how much this tastes like caramel! 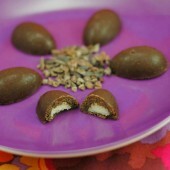 It was decadent and creamy, and I loved it with bits of chocolate chips and cacao nibs mixed in. This Grain-Free Autumn Fruit Crumble is a quick and easy recipe that is perfect for this time of year. Although it was hard to choose, this was probably my favourite so far, likely because these seasonal fruits have been calling my name for the last few weeks. I loved the crunchy topping, and the perfect balance of tart and sweet fruit. I served it with a dollop of coconut whipped cream (because whipped cream makes everything better). Luckily, I was given permission to share this recipe with you today—straight from the book! 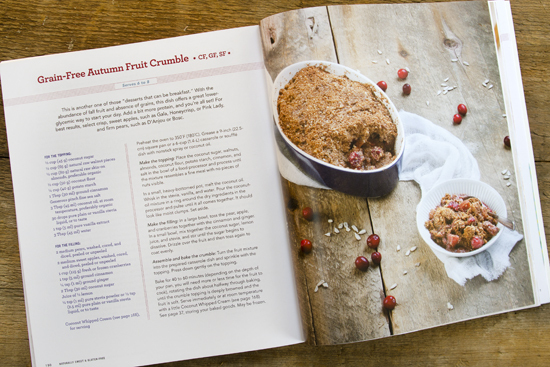 If you get a chance, I highly recommend trying out this crumble recipe, and picking up a copy of Ricki’s book. The holidays are fast approaching, and this book would give you lots of options for desserts that will please everyone. Enjoy! Preheat the oven to 350F (180C). Grease a 9-inch (22.5cm) square pan or a 6-cup (1.4L) casserole or souffle dish with nonstick spray or coconut oil. Make the topping: Place the coconut sugar, walnuts, almonds, coconut flour, potato starch, cinnamon, and salt in the bowl of a food processor and process until the mixture resembles a fine meal with no pieces of nuts visible. In a small, heavy-bottomed pot, melt the coconut oil. Whisk in the stevia, vanilla and water. Pour the coconut-oil mixture in a ring around the dry ingredients in the processor and pulse until it all comes together. It should look like moist clumps. Set aside. Make the filling: In a large bowl, toss the pears, apple, and cranberries together with the cinnamon and ginger. In a small bowl, mix together the coconut sugar, lemon juice, and stevia, and stir until the sugar begins to dissolve. Drizzle over the fruit and then toss again to coat evenly. 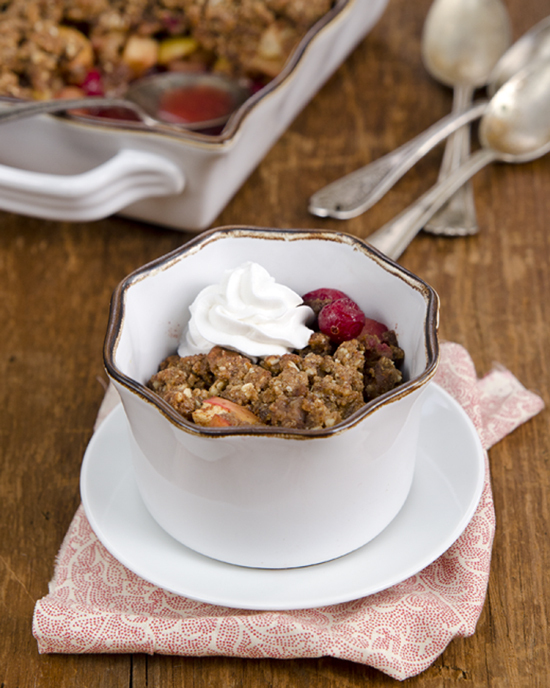 Assemble and bake the crumble: Turn the fruit mixture into the prepared casserole dish and sprinkle with the topping. Press down gently on the topping. Bake for 40 to 60 minutes (depending on the depth of your pan, you will need more or less time for the fruit to cook), rotating the dish about halfway through baking, until the crumble topping is deeply browned and the fruit is soft. Serve immediately or at room temperature with a little coconut whipped cream. May be frozen. Strawberries & champagne sorbet from Sweet Eats for All + a giveaway! And we will have to arrange for another in-person meeting sooner rather than later!! Thanks, Ricki! I’m glad you like my review–the praise is well deserved! I love Ricki & all her recipes! I’m patiently awaiting my copy of the book, which should arrive in the mail sometime this week. & I agree with Ricki–beautiful photos. Thanks, Janae! I hope you enjoy Ricki’s book as much as I do. All those recipes look delish! And congrats to Ricki for a great new book!